Cleveland East Ledge Lighthouse in Bourne, Mass. Eight miles south of the Cape Cod Canal entrance. Cleveland Ledge Lighthouse is one of the newest added in lighthouse service, and the most recent added in Massachusetts. Construction began on the 74 foot tower in 1940, but was not completed until 1943. due to preoccupation with the WWII efforts. The lighthouse was named after President Grover Cleveland, who would come to fish and vacation in Bourne. Shortly after the lighthouse was built, in 1944, the light’s structure was put to the test when it survived the hurricane of 1944 with nine crew members inside. With the crewmen constantly bailing out rushing water into the engine room, the water rose to within inches of the critical batteries, but the crew were able to keep the level from rising any higher, saving the station. Luckily, all nine survived without serious injuries. 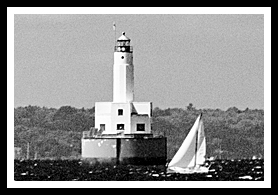 Jim Walker and his crew were stationed at the lighthouse in April of 1963. One day the crew received a call from the Corps of Engineers warning that a nuclear submarine was headed directly toward them and they were having trouble contacting the vessel. The crew scurried out to the rail and could see the red and green lights of the submarine coming towards the tower. Just before reaching the lighthouse, the submarine turned, leaving the crew relieved, but a bit shaken. From the rotary at the Bourne Bridge, take Route 28 South, then bear right onto Route 28A. Take a right onto Wing Road and then take a left on Quaker Road and follow to Old Silver beach where you can a distant view of the lighthouse. There are no tours that leave out to visit the lighthouse, but charters are available. Bourne lies at the “gateway” to Cape Cod along the Cape Cod Canal with parks outlining the canal shores for nice quiet views. The Cape Cod Canal railroad bridge itself is quite a spectacle as a verticle lift bridge, and the view from the Cape Cod Canal Bridge takes you over 135 feet above the canal. In Bourne, Monument Beach is a popular destination and is located just before the entrance to the Cape Cod Canal. It’s a good-sized quiet beach, is very popular with local windsurfers, and has a docking area for boaters. Visitors can also enjoy the Concerts in the Park series over the summer, and famous Scallop Festival in September. For those who like large beaches and the crowds, Gray Gables Beach in Bourne will keep you interested. Basketball net provided for anxious teenagers. For those you want to really relax, tiny Queen Swell Beach has clean white sand, roped off swimming area, and an area for fishing, and is great spot for "quiet" activites. For the kid in all of us, there is the Cartwheels2 Fun Center with the largest Go Cart track in the region, including Cape Cod.